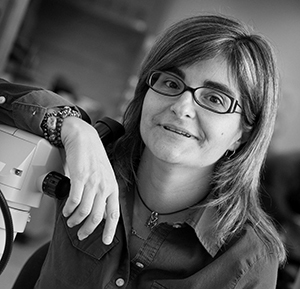 Esther Betrán is an Associate Professor in the Department of Biology at the University of Texas at Arlington. Dr. Betrán received her Ph.D. in Genetics from the Universitat Autònoma de Barcelona, Spain, working with Drs. Alfredo Ruiz and Mauro Santos. As an European Commission Postdoctoral Fellow at the University of Cambridge, UK, and later as a Postdoctoral Research Associate at the University of Chicago she worked with Professors Michael Ashburner and Manyuan Long on duplicated genes and their functions in Drosophila and humans. Dr. Betrán is interested in the origin of functional innovations in the genomes. One of the main research projects in her NIH-funded lab is the study of retrogenes (i.e., gene duplicates produced by means of an mRNA intermediate). Her extensive work in this area demonstrated that many of these duplications contribute to male germline functions and may play a role in the resolution of sexual/genome conflicts. In collaboration with Dr. Cédric Feschotte, the Betrán lab is also working on understanding functions of proteins domesticated from transposable elements. The results of this work suggest that some of these proteins are also involved in male and female germline functions.